The house is a large south facing family home with plenty of light and a spacious feel. It is set within the Dedham Vale made famous by John Constable and is situated on the edge of the picturesque village of Higham from which Constable painted the picture entitled 'The Stour Valley from Higham'. It is within a designated 'Area of Outstanding Natural Beauty'. The house is well maintained with modern facilities throughout and provides everything needed for a relaxing break in the countryside. It easily accommodates 12-14 people in comfort and has many areas both inside and outside to relax and enjoy the company of others. It is a house for all seasons; in the summer the large heated swimming pool, summer house and terrace with brick pizza oven/BBQ provides a great outside experience whilst in the colder months the house not only has the benefit of standard central heating but an Aga warmed kitchen, an open log fire in the dining room and underfloor heating in the new south facing sun room. There are many books and games on offer including the more traditional shuffle board which provides a great family evening as well as games consoles such as Nintendo Wii and PS3. There is a large 42' TV and a vast selection of DVD's. The property has WiFi. As a family we love entertaining and cooking and so the kitchen is well equipped and includes a 4 door Aga (off from June - end September) and a separate gas oven as well as an electric oven and 5 gas burner hob. The house has ample seating for dining including a large dining room and table which seats 14 people as well as a breakfast room with a large pine table and a separate breakfast bar in the kitchen. There is a 30m² sun room which has lovely views over the garden and Dedham Vale, a good sized sitting/TV room and a study with sofa. Four out of the six bedrooms are south facing and all are of a good size with ample storage and comfortable beds with quality bedding. Two of the bedrooms are en suite and can be self contained as they lead off the main landing to their own small hallway. Two of the remaining bedrooms have showers and another bedroom has a wash basin. All bathrooms and showering facilities are modern and either recently refurbished or installed and all have underfloor heating. In the garden there is a large swimming pool of 40'x20' with an electric safety cover (open from June - end of September). 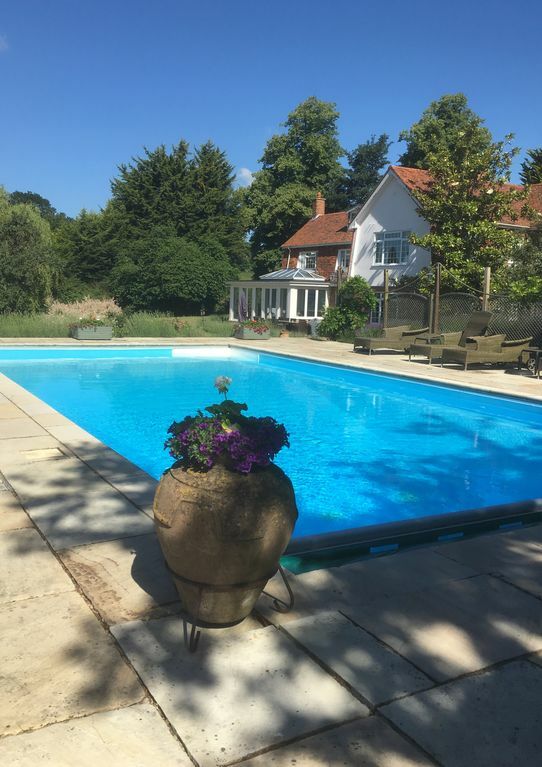 A large terrace surrounds the pool and has stunning views over the Stour Valley. During the summer there are sun-beds available and a pool house with a kitchen area, fridge, wash basin and toilet. The pool house is stocked with melamine dining service and safe glasses for use round the pool as well as cutlery and so there is no need to return to the house when dining outside. The pool dining area has a large table, a brick pizza oven and BBQ. There is also an outside shower fed by hot water. The house is surrounded by wonderful walks and is close to the famous Stour Valley Pathway and St Edmunds Way. The historic village of Dedham provides local shopping along with the nearby farm shop and the oldest recorded town in Britain of Colchester and the port town of Ipswich are within 6-8 miles. Flatford Mill is close by and it is possible to take a canoe there from nearby Dedham. The house has a canoe and access to the local river can be gained at Stratford St Mary. There are many local pubs and bistro pubs including The Swan at Stratford St Mary which is only a short drive or 20 mins walk away. There are also plenty of great restaurants in the area with the famous Maison Talbooth and its sister bistro, Milsoms, also situated in the nearby Stratford St Mary. The River Orwell and Alton Water provide local sailing facilities and the beaches of Felixstowe, Frinton and Walton on the Naze are within 30mins-45mins drive away. London is an easy commute with the local train stations of Manningtree, Colchester and Ipswich running regular services to London (49mins), Cambridge (1h 19m), Norwich (42mins) and Harwich (17 mins). The nearest international airport is London Stansted (45min drive) and the nearest International port is Harwich (25mins drive). We are a family of 7 and have owned our family home in Higham for over 26 years (8170937) and our apartment in Nice, Palais Yolande, for over 14 years -I advertise this on Ownersdirect but also have my own site for this property which can be found by searching the name of the property, Palais Yolande. Both provide space for us all to enjoy our time together and offer a great base from which to explore the English countryside and the French riviera. Our house in Higham has provided us with a wonderful space to bring up our 5 children and gave them the freedom of the countryside literally on the doorstep. As children they spent summers on the beaches of Walton, Thorpeness and Frinton and sailed, rowed and canoed on the local rivers and waters of Alton. All five children are now young (and not so young) adults and really enjoy the fact that London is easily accessed from our local train stations and that we are equidistance between the major towns of Colchester and Ipswich. My husband has commuted daily to London for over 20 years from Manningtree, a small country station with one of the few remaining independent platform bars left in the UK. Most of our children have now ‘flown the nest’ but they all enjoy meeting up at home for rest and relaxation; time round the pool or in the colder months donning their welly boots and walking the fields to the local pub. We think everyone will enjoy their time at our house as not only does it provide all creature comforts and a holiday in itself it is a great base from which to explore coast, city, country and an area which is quintessentially English. Oil heating and hot water provided. Reasonable usage is included. All bed linen included for 14 persons. Any additional bedding and changeover during week will be charged accordingly. We have internet and booster. House and separate pool towels provided/ Towels not to be removed from the premises e.g. for beach use. Large American styled fridge/freezer (with ice maker) and further fridge in summer house. 4 oven Aga (Oct - May) single gas oven, single electric oven with 5 gas hobs. Full set of dishes and utensils to entertain and day ware. The kitchen is very well stocked. I am sure you will find all you want from bread maker, ice cream maker to a fondue set and chef's blow torch. We have a lovely dining table to seat 14 persons. There are place settings, candle holders, cutlery and glasses provided separately in the dining room. Yes Please respect the fact that we have left them for you and leave them when you leave. Fantastic break at Pear Tree Cottage. The property is spacious and extremely well equipped. We had a minor problem with heating in one of the six bedrooms (user error) and someone attended the property to fix it almost immediately. I have already recommended this property to friends and family. 5 stars. Thanks Janette for your hospitality! The house that has everything! We were a group ranging from a 4 month old baby to a 70 year old granddad (me!) and we had the most wonderful week staying at Pear Tree House! The owner, Janette, could not have been more helpful and the house had everything we could have asked for and more! The weather was perfect for the whole week, so we were able to make good use of the nice sized swimming pool, the pizza oven and the barbecue as well as the table tennis table! The kitchen was superbly equipped, the bedrooms were most comfortable and the bathrooms provided with high class toiletries. Our stay could not have been better! A home from home with extra plus! We felt at home the moment we arrived in this well-equipped, spacious, fabulous place. Everything we could possibly think of was supplied (and helpfully labelled! ), and everything we could possibly want to know was included in the most comprehensive welcome pack we have ever come across. The suggestions for places to visit were equally detailed, as well as personalised with Janette’s own helpful comments. On top of that were the thoughtful, extra touches, like the treats on arrival, notebooks and pens by the beds, blankets for outside, the chalkboard for messages - we made full use of that, writing various funny messages to each other on it every day! There are lots of things to do in the area, but we also had more house days than we would normally on these holidays as so much was provided. We watched films, played games, read some of the countless books, played table tennis, swam in the pool, had a number of piano recitals and enjoyed several barbeques. We ran out of time for toasting marshmallows round the fire pit – next time perhaps. We had planned a joint birthday/GCSE results celebration during our stay and the spacious grounds provided the perfect place for this family event - an 80s fancy dress (Ghostbusters, ET, Mr Spoon and Homer Simpson among them! ), followed by a party by the pool and then a lovely meal at a Vietnamese restaurant in Colchester (via a local party bus!). We've had these large family holidays for a few years now, mostly abroad, and we all agreed that this was one of the best largely due to this super house. We rarely go back to the same place twice as we like to try new places, but we have all talked about a return to Pear Tree House. We revisited this year, as we enjoyed last year so much. Super condition, lovely and clean and well cared for. Janette is very thoughtful, even tuning the piano the week before we arrived (as she knows we play every day). We enjoyed a couple of visits from the local fishmonger, rowing on the local river and improved on our outdoor pizza oven skills. Even more organised this time to have marshmallows and baked potatoes cooked on the fire pit whilst the children sang Scout songs. A lovely relaxing time had by all. We had 3 generations of adults staying at Pear Tree House for the week and everyone had a great time. The house is beautiful, has everything you need and is set in a lovely location. Janette (and her dad) could not have been more helpful, from the comprehensive information pack before we arrived to sorting out power cuts due to lightning striking a tree in the garden. Although we always bring plenty of things to do when we rent houses, there was more than enough to keep us amused with lots of books, games, a ping pong table and of course the amazing swimming pool! Although there is much to see in the area, due to the glorious weather we had during our stay we didn’t feel the need to leave the house and spent our time relaxing by the pool, swimming, playing games, making use of the BBQ and just enjoying each other’s company in a beautiful setting. I highly recommend Pear Tree House and we hope to return again. The whole booking process was easy and Janette was a great host. We were all blown away by the house! So much light and so many nice touches. The perfect family home. It had everything and more than we could have ever needed! The location is just lovely. I can't begin to explain the view, particularly from the bedroom I was staying in. Waking up to sunshine and rolling countryside. We would love to move in/stay again! And hope to do so in the future! I must also recommend Zenith Kiting if you want to try local paddleboarding. Was great wet fun! There are plenty of courses run locally which can be arranged prior to your stay including painting, cookery and sailing. Local guided tours/walks are also available by prior arrangement. Felixstowe both sand and stone beaches, a pier and a small fun fair (30mins/20 miles). Clacton/Walton/Walton on Naze (30 mins), Aldeburgh (45mins), Orford (45 mins) and Southwold (1 hour) make good day trips. Orwell Estuary and the villages of Pin Mill and Woolverstone with their yacht clubs and marina within 20 minutes drive. Car is essential. There are plenty of car hire places at the listed airports or locally at Ipswich or Colchester. City of London (transport hub) - 50 mins by train from Colchester. London Stansted is the closest airport - (45 minutes drive/39 miles). Coach service to Colchester/Ipswich. There are many great eating places in the locality from fine dining at Le Talbooth in Stratford St Mary and Hintlesham Hall at Hintlesham to gastro pubs such as The Swan in Stratford St Mary (a few minutes drive from the house or a 20mins country walk), The Crown at Stoke by Nayland, The Sun at Dedham and Milsoms also in Stratford St Mary. There are the interesting niche restaurants such as The Fountain House at Dedham and The Thorn at Mistley. Infact there are really too many to mention. A file is available in the house and a list is sent out just prior to your stay so that bookings can be made if required. There are plenty of places to visit in the area from Colchester Castle, Flatford Mill and Dedham Village, Colchester Zoo, Lavenham, Long Melford, Cavendish and Clare, Bury St Edmunds, Woodbridge, Orford, Framlingham Castle, Kentwell Hall, Ickworth House, Sutton Hoo, Aldeburgh, Snape Maltings, Thorpeness, Walberswick, Frinton, Walton on the Naze. Again a full list is provided in the house files. Cinemas and theatres are available in Colchester and Ipswich and a day trip to London is easily done. This is a great area to walk with both the Stour Valley Path and St Edmunds Way on our doorstep. We are very popular with cyclists as there are plenty of cycle routes around the house. Alton Waters has a hire shop and a great circular off road cycle route. There are plenty of golf courses closely including Stoke by Nayland (5 miles) and Raydon Brett Vale (2 miles) with a links golf course at Old Felixstowe (22 miles). Booking Notes: A 25% non-returnable deposit is payable on booking. The balance must be paid 6 weeks before the start of the letting period. A returnable deposit of £1000 is required. It is expected that there are no missing items from or damage to the property at the end of the letting period and that the house/gardens etc is left in good condition ready for cleaning. Changeover Day: During peak season changeover day is Saturday. At all other times the letting period is flexible including long weekends. Access to the property will be from 4pm. Departure time is 10am unless agreed otherwise. Notes on prices: Please note that 3 night weekend lets are charged at 70% of the weekly rate. This will include any let which involves a Saturday night. For any other lets of less than 7 nights please request rates. A cleaning fee of £175 is chargeable for lets of less than 7 nights except for weekend lets where no fee is chargeable. Any bank charges payable as a result of receiving/returning payments/deposits will be the responsibility of the client.